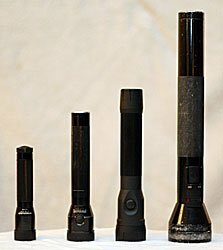 Let me be up front and tell you the Streamlight PolyStinger DS LED flashlight is one of the best flashlights I have ever tested for police work. 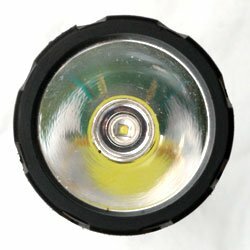 I have field tested this flashlight for two months, and I have been absolutely impressed by its performance. In fact, it is now my primary light, replacing my personally owned, full-sized Streamlight SL-20, and it puts my department issued MagCharger to shame. I found the PolyStinger DS LED to be very bright, very durable, and have an excellent run-time. Not only was I impressed by it, at least four other officers on my squad have already purchased this light after seeing mine. Several other officers have said they are setting some of their money aside to buy one also. The PolyStinger DS LED has four lighting modes: low, medium, high, and strobe. The low and medium levels are good for navigation or task lighting, while the high level is excellent for police applications. The strobe mode is designed to disorient subjects during arrests, building searches, and similar situations. I’ve wondered how effective the strobe mode would be in distracting a subject. Well, I recently had the chance to use the strobe mode on an arrest of a felon, with prior arrests for fleeing and resisting. In this case, the subject was sleeping in the back of a parked car. The primary officer had probable cause to arrest the subject, and the car owner had given us the keys to get into the car. Knowing the subject would likely flee and/or fight if given the chance, we located the sleeping subject and used a patrol car to block the subject car into place. The primary officer approached the side of the car, closest to the subject’s feet, while I approached the side of the subject’s head. As my partner began unlocking the door, the subject woke up. As soon as he started waking up, I shined the PolyStinger DS LED in strobe mode in the subject’s face. The suspect was visibly stunned, and was easily pulled from the car and handcuffed. While on the way to jail, I had the suspect ask me “What kind of light was that? F*%$! I thought there were aliens or something!” The strobe mode may not have the same effect on every person, but it worked in this incident. The PolyStinger DS LED uses C4 LEDs and microprocessor regulation of light output to give you a very bright, constant light source. In the high mode, the Streamlight measures 24,000 candela peak beam intensity and 185 lumens. Medium and low output levels measure 12,000 candela/95 lumens and 6,000 candela/50 lumens respectively. Something I really liked about the light output, was the tight focused beam with a very bright periphery area. So when you are more than a few yards away from someone, you can still cast very bright, usable light on them. Want to light up the interior of a car from the other side of the parking lot? You can do it. Light Output, L-R: SL-20X and PolyStinger DS LED. Note both the brighter, white focus point of the PolyStinger and the much brighter periphery cone. The flashlight has a very good run-time also. On the high setting, output is pretty much constant for 1.75 hours (dropping only to 160 lumens), before dropping noticeably. Run-time on the lower levels run much longer (about 3.75 and 7.5 hours respectively.) Using just the strobe mode, you can expect up to 5.5 continuous hours of running. 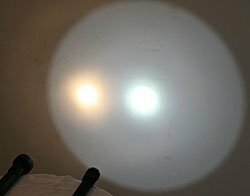 In actual practice, I used the flashlight every night, charging it after every shift. I never noticed any loss of light level. The flashlight was always bright. Slightly larger than the original Streamlight Stinger, the PolyStinger DS LED will not easily fit into any of the sleeves or cases I tried that were designed for the original. In fact, this was the only problem I found with the DS LED. I stopped by the local police supply shop, and they did not have anything that fit this flashlight. So, for about six weeks, I simply carried this light in my back pocket. Fortunately, the supply shop got some half-sleeve scabbards in, and things are good. The switches on the PolyStinger are very durable, and have been tested by Streamlight to 1,000,000 actuations. In my two-month test, neither switch showed any signs of wear, much less failed. Other Streamlights I own start to show some wear on the rubber switch cover after a few years of use, but, unlike other brands, I have never had a swtich fail. I expect the DS LED to be of the same quality. A note about the switches: they can be used as normal, click and it it is constant on, or by lightly touching them for momentary on/off. So, whichever switch style you like, you are covered. A lot of officers currently own, or are issued, the original Streamlight Stinger. An unexpected feature of the DS LED is that the new PolyStinger fits into the same chargers that the old Stingers and PolyStingers use. So, if you own your own Stinger, you can purchase just the new flashlight without the chargers and save some money. 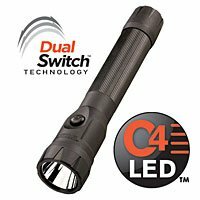 Additionally, departments can upgrade to the Streamlight PolyStinger DS LED flashlight without having to purchase new charger banks or individual chargers, saving money in the department’s budget. I used the light in all sorts of Florida weather: hot, cool, and rainy. I never had any problems with water intrusion, fogging, or anything else. Streamlight backs the PolyStinger DS LED with a limited lifetime warranty. Bottom Line: This is an excellent flashlight for police or home defense use. The high power mode is extremely bright with a well-focused beam and excellent battery life. The PolyStinger DS LED uses the same chargers as the original Stingers, but it cannot use the same carry cases. For a top-notch duty flashlight, the MSRP of $209.00 is reasonable. The fact that you can pick one up for as little as $110 on Amazon, means this flashlight is an excellent bargain. If you are looking for a new duty or home defense flashlight, do not hesitate to buy this light. You won’t be disappointed.